It all began when I bought a basil plant to add to my other herbs for cooking. Basil is always good to have in the kitchen and the leaves make a good combination with mozzarella cheese and sliced tomatoes for a Summer salad. I notied that our local store was selling fresh basil plants in large pots which was ideal for my needs. I bought my potted basil and it began to grow, so everything under control, or was it? 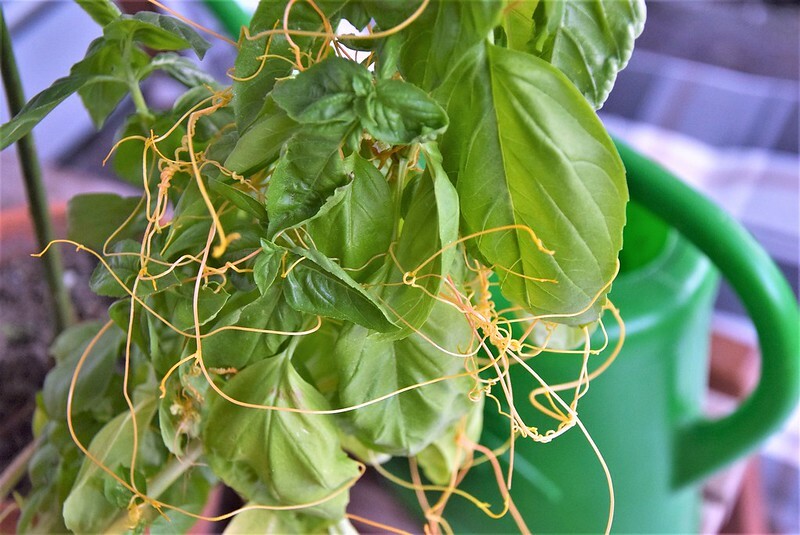 A few days later I noticed some fine white strands growing out of the plant and was pleased to see that it was independly growing roots and I could even grow more plants from my original, although I was not aware that basil was so self growing. At least that was what I thought, but these white fine threads were growing and growing and I was not sure where they were going. The were twining all over my basil plant and hanging down, as if searching for somewhere to twine on. In the meanwhile I had removed some leaves for a salad, and so at least we were surviving. However, I had my doubts, and these strange growths were definitely not new roots for a new plant. What do you do? Today we have computer and online colleagues everywhere. I started an enquiry in Facebook and discovered that the answers to my questions were not the answers to my problems. There were suggestions that did not meet with my mystery growth. 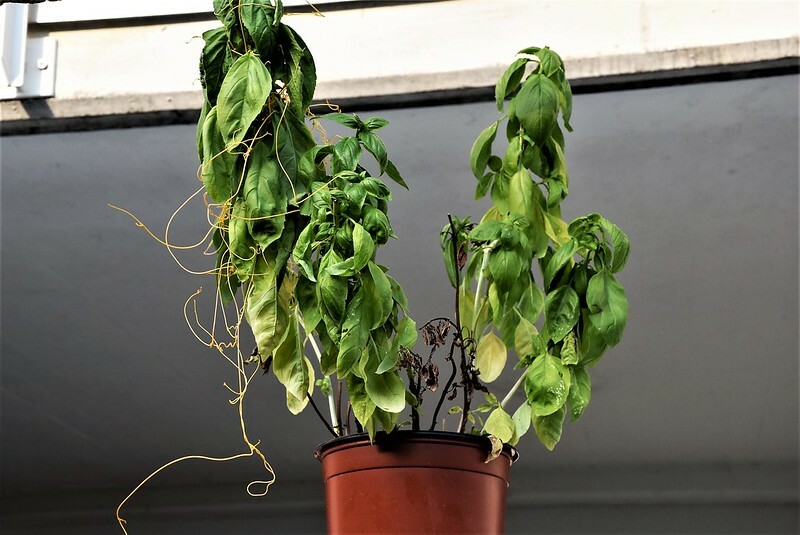 In the meanwhile my basil was still being captured by this strange growth and then an expert noticed my dilemma in WordPress and gave me an answer. He said that this was most probably a parasitical growth known as dodder and was quite widespread in parts of the States. Once it discovered a suitable host, it grew to the extent that the original plant became a dodder, because the original plant was being absorbed by the dreaded dodder. I naturally had a look in Internet and the suspicion was confirmed. The mystery was solved. There are various European forms of dodder, although I think I had the original imported from the Stats. In the meanwhile a couple of online colleagues informed me that they also had dodder in their garden and it was almost indestructible. 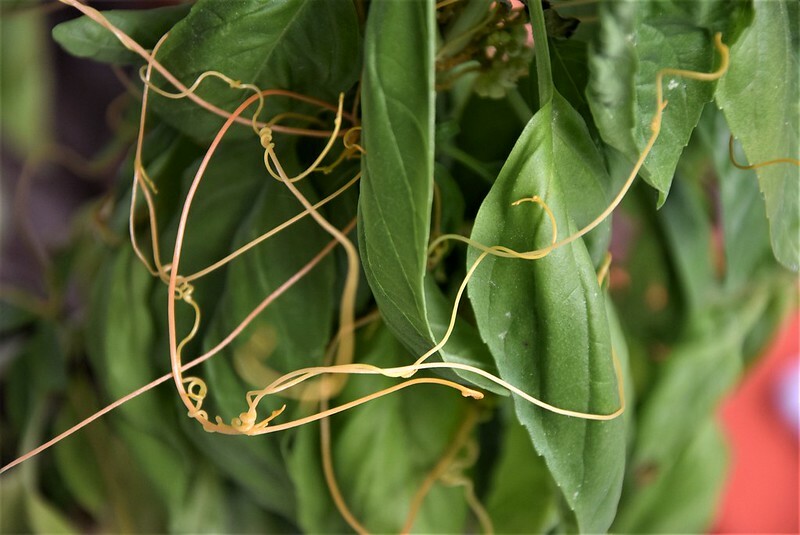 What a Swiss basil plant, probably with origins in another country, perhaps Italy, was doing with dodder I do not know. I did not know where my local supermarket got their garden herbs, but somehow the dodder seeds were in the earth and happy to take over my basil. 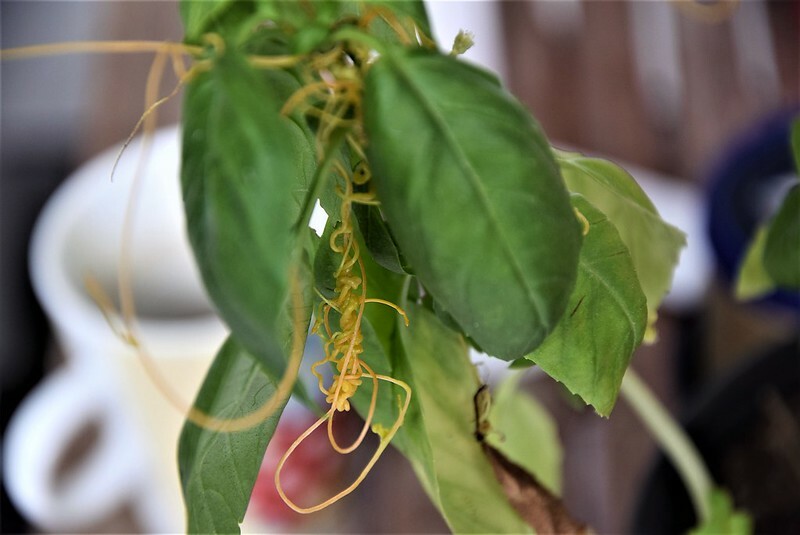 In the meanwhile the dodder was growing at a fast pace and my original basil plant was being strangled by its threads. I then made my decision. After warnings about dodder taking over gardens and other plants by just spreading its threads and seeds (yes it was even flowering in the meanwhile), I removed my basil and threw it into the compost. I am sure it is now still growing somewhere and supporting the dreaded dodder, but not in my garden. The mystery had been solved. It even twined around itself when it found nothing better. I see it is a form of Morning Glory – we have the bindweed version in a section of our garden – it is indestructible. When I do manage to dig it up, I leave the roots in the sun to dry then burn it. If it goes on the compost heap it does not break down and will begin to grow wherever the compost is spread. Perhaps you should report it to the shop where you bought it? This was two years ago and was probably a fluke of nature. They have these larger versions of basil annually and it has never happened again. It is really not a typical European parasite and I have no idea why it happened to be in my plant but it was an interesting experience. Wow Dodder on a basil plant! That is really unusual. I have seen it occasionally in the wild but never on a house plant. I think dodder is native to Europe ( last time I saw it was on birthwort in French vineyard) but it would be interesting to see it seed and grow. Apparently it is quite widely spread in parts of the States. I had never heard of it before it began to grow on my basil and it must have been in the earth somehow. The European variety is different to that in the States and I have no idea what sort mine was. Your post held my attention right to the end! A real mystery! I never heard of that before! And I thought I’d seen ALL the vines that twine around here. Yuck! I remember, but I do not remember it looking so bad.